So I surfed over to YTMND, and fresh in the "recently created" section, I found this site. 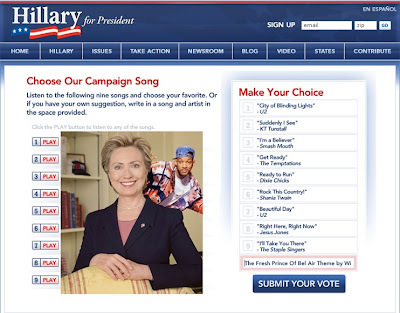 It's quite simple--Hillary is asking online supporters to suggest a campaign song for her. Just go there, and in the "enter another song title" field, copy and paste in "The Fresh Prince Of Bel Air Theme by Will Smith" and click on the "Submit your vote" button. You can do so multiple times.